IAU travel grant applicants have now been notified. 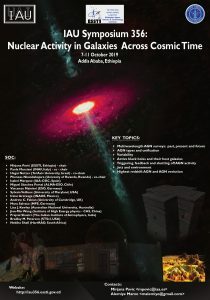 Organizing this IAU symposium in Ethiopia about the ‘Nuclear Activity in Galaxies Across Cosmic Time’ has two main objectives. First, we want to have a general overview of AGN physics, including recent findings and progress in observations, simulations, and theory, and to discuss some of the open questions required for the understanding of the role of AGN in the broader context of galaxy evolution. Second, with this symposium we would like to bring for the first time world experts in our field to the East-African region and contribute to the development of science in Ethiopia and Africa, which is very much needed. Different countries of Sub-Saharan Africa, including Ethiopia, are now having first generations of students doing their MSc and PhD degrees. By organising this sympoisum in Ethiopia, we want to contribute to inspire new generation of scientists, and in particular astrophysicists. We also want to show our support to countries that just now start the scientific and technological development in astronomy and space science. In addition, a training for graduate students and for the secondary school teachers will be carried out by conference experts before and after the symposium. Outreach activities will be also organised for general public and school children who for the first time will have an opportunity to interact with world expert astronomers.